The widest band on this towel has two rows of confronted wyverns (mythical winged dragons) and the band at the top has shields with a 'vol', or pair of wings. 4) pelican in her piety, with two narrow blue bands above and below. 5) animal with cloven hoof; two narrow blue bands above and below. The decorated bands do not have the same orientation, even within their ends (ie one band appears upside down next to another). The towel is hemmed at each end. One long side has an intact selvedge, the other is cut. This and nine other Perugia towels were among a group of more than 100 textiles of varying date and technique purchased in 1884 from the executors of the estate of W Buller. They were brought to London from Rome and Florence, where by inference he lived, but there is no more information available about him, or further provenance for the textiles. Historical significance: This sort of textile had both ecclesiastical and secular use, but this particular example includes specific Christian iconography, suggesting it may have been intended as altar linen. Among the bands of decoration is the pelican in her piety, who according to legend pierced her breast to feed her young with her own blood and symbolized the sacrifice of Jesus Christ. Originally derived from a passage in the Bible (Psalms 102,6), the reference was well known to medieval commentators and consequently the pelican is often depicted as a symbol of the crucifixation from the thirteenth century onwards. 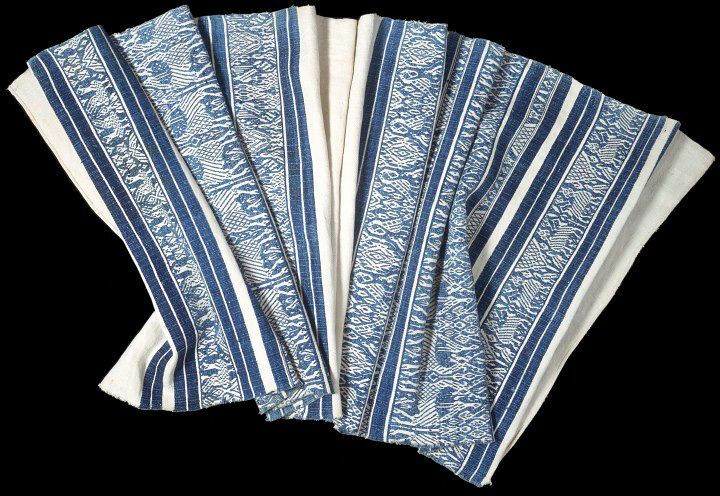 The name usually given in English to textiles like these is 'Perugia towels', deriving from tovaglie perugine. Tovaglia would usually be translated as tablecloth, and tovagliolo as napkin, so towel is not necessarily the best defining term for them; their use was in both ecclesiastical and secular contexts, and their function also included napkin and table cover, as well as altar cloth and sacristy hand towel. (In a painting by Antonio da Fabriano in the Museo Piersanti, Matelica, one is depicted as a loincloth for Christ).They were woven in mixed twill, ofter diaper, with white linen warp and weft, and had the characteristic feature of bands of pattern created with a supplementary weft of cotton, almost always dyed blue with indigo or woad, though occasionally in red or brown. Endrei (see bibliography) speculates that they were woven by fustian weavers, who were prohibited by statute from weaving in pure linen, or in plain weave. He thinks it plausible that as cotton takes indigo dye much more successfully than linen, fustian weavers were motivated to produce these textiles with strongly coloured bands of cotton decoration which linen weavers could not achieve. Antonino Santangelo in The Development of Italian Textile Design (1964) quotes from an inventory of 1482, which describes two napkins being '...in the style of Perugia' (banbagia a la perugina); if we infer that these are the blue banded towels under discussion, the association of them with this region appears to date back to at least the 15th century. However, Peter Thornton (The Italian Renaissance Interior 1991), while mentioning a reference to tovallie alla perugina in a 1574 inventory for Vasari's house in Venice, cautions that transcribers of inventories might misread alla parigina, meaning 'in the Parisian fashion', which he thinks likely to mean simply diaper-patterned; the finest table linen was produced in northern France, particularly Paris. Endrei suggests that the towels' origin, influenced by designs from silks woven in Lucca, could go back to the 14th or even 13th century. 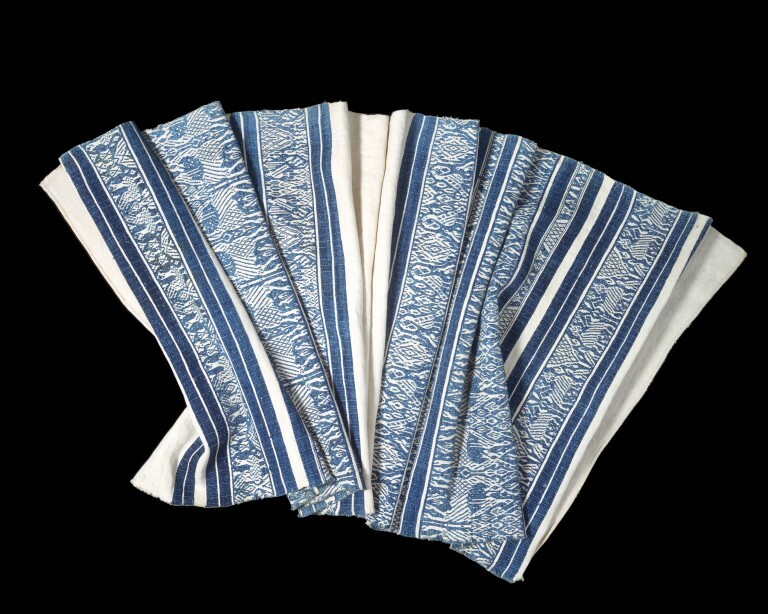 A gradual simplification in design of the pattern bands may be related to the growing sophistication of linen damask weaving from the 15th century, and its replacement of the blue-patterned 'towels' in dining use in wealthier households, and in the Church. The simplification in design apparent in extant examples may also be related to the diffusion of the technique. Similar woven cloths can be found in Friuli and Carnia, the Tyrol, Southern Switzerland, Germany, Slovakia, Bulgaria, Romania and Hungary, and were woven at least until the 18th century. Endrei, Walter. Les etoffes dites de Perouse, leurs antecedents et leur descendance. CIETA Bulletin 65, 1987 : 61-68. Linen towels like this are represented in many Tuscan paintings of the 14th and 15th centuries. 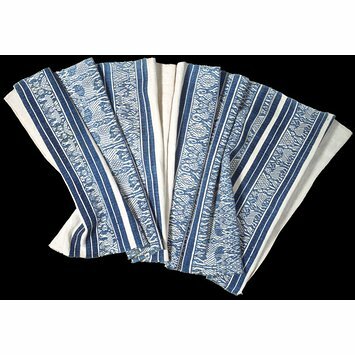 With their distinctive blue and white bands of decoration, they were produced in a variety of sizes that could serve different purposes, from small hand towels to large table cloths. Covers such as this combined concerns for hygiene with decorative appeal.